Today's revision to Q3/13 GDP gives us our first look at corporate profits for the quarter, and they just keep on growing. Nominal after-tax profits are at a new all-time high, and have risen almost 9% in the past year. This is very impressive no matter how you look at it. 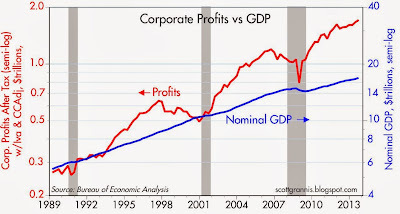 The two charts above show after-tax corporate profits and nominal GDP; the first chart takes the long view, while the second chart zooms in on the past quarter century. 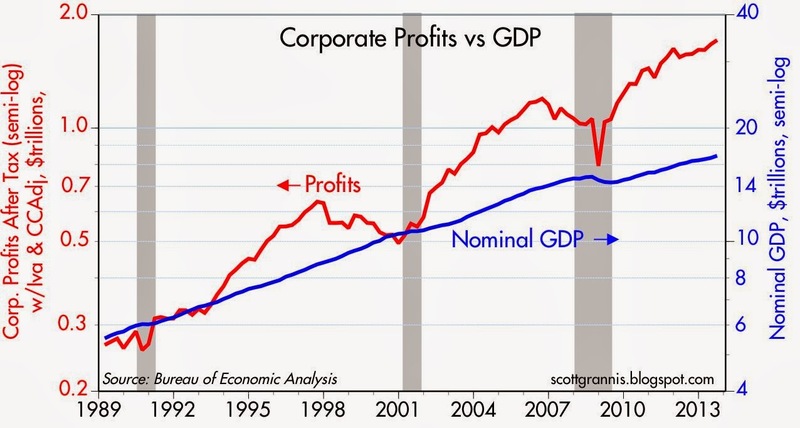 The y-axes of both graphs have similar ranges, so it should be apparent that corporate profits have risen at a much faster pace than nominal GDP both in the current recovery and over the past two decades. In effect, the market is priced to a significant deterioration in the profits outlook. Yet profits continue to defy their presumed mean-reversion tendency and continue to increase. Profits will undoubtedly decline when we suffer the next recession, but that might be years away. Worrying about an imminent recession is characteristic of this entire recovery, as I explained yesterday ("The most risk-averse recovery ever"). But so far, the pessimists have been missing out on a fabulous equity rally. 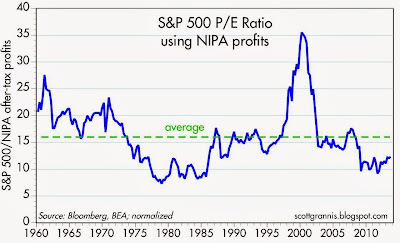 The chart above shows the PE ratio of the S&P 500 index using NIPA profits (the BLS's calculation of total economic after-tax corporate profits). 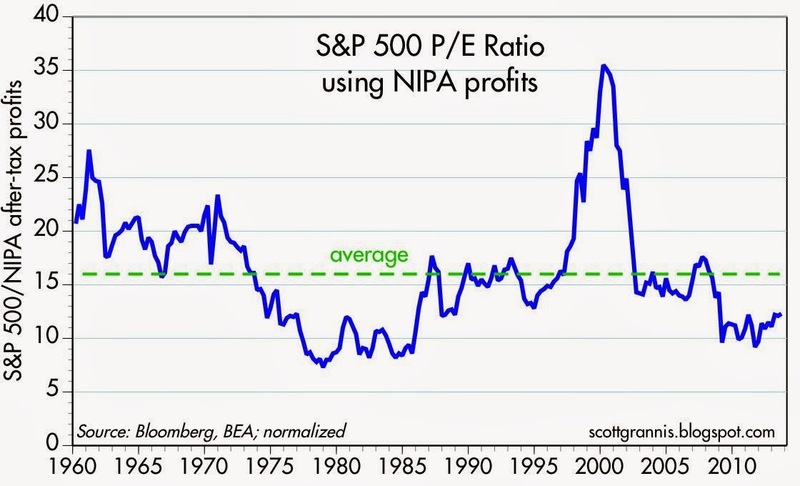 I've normalized the S&P 500 index so that the average PE ratio using this method is similar to the long-term average PE ratio of the index using reported corporate profits. 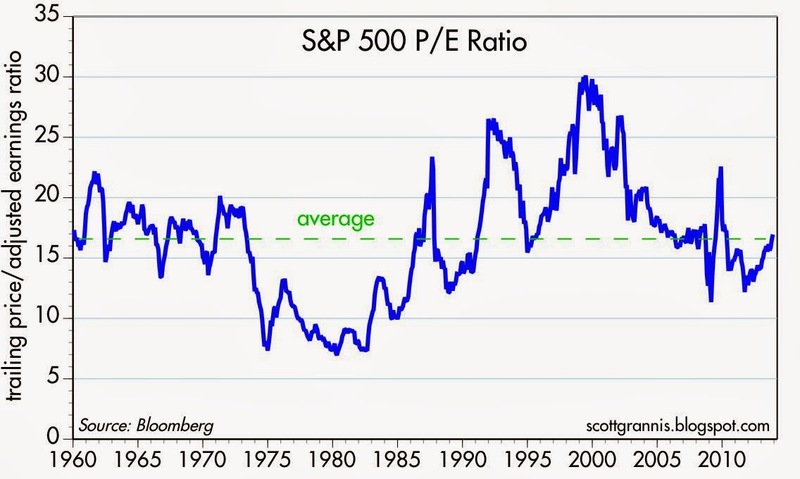 Here we see that PE multiples are significantly below their long-term average, whereas the reported PE of the S&P 500 is about average (see chart below). 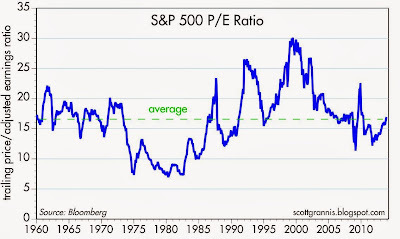 I explained the reason for the differences in these two PE ratios, and their rationales, here. In short, this market continues to be very skeptical of the future. Very risk averse. sentiment is at best complacent and you have a very nice recipe for the next bear. not to mention that the fed has artificially kept rates way to low. the fed has a 100% track record at *&^%ing up the markets and i see no reason that this time is any different. As I try to point out in my post, what "steve" describes is what I believe the market is priced to. 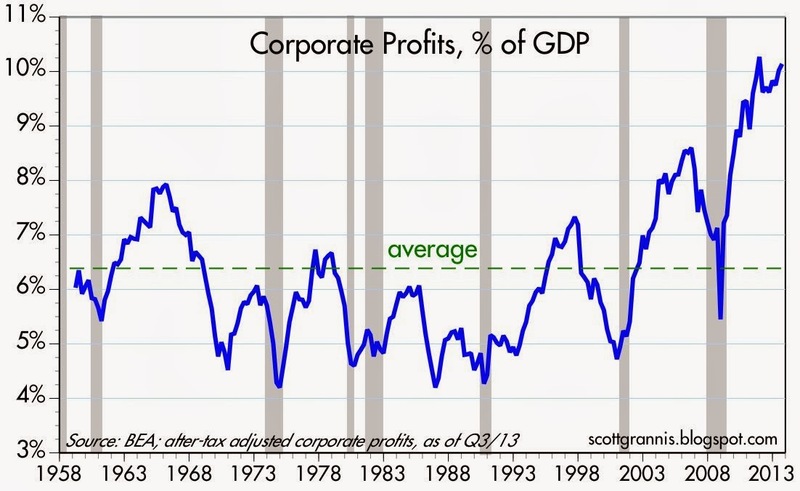 The market has been worrying about a profits mean reversion for years, but it hasn't come. 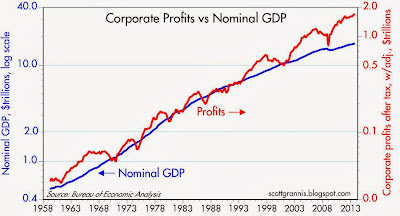 Arguably, since the market fears substantial weakness in profits, the reality of a profits decline might not cause the market to decline significantly. 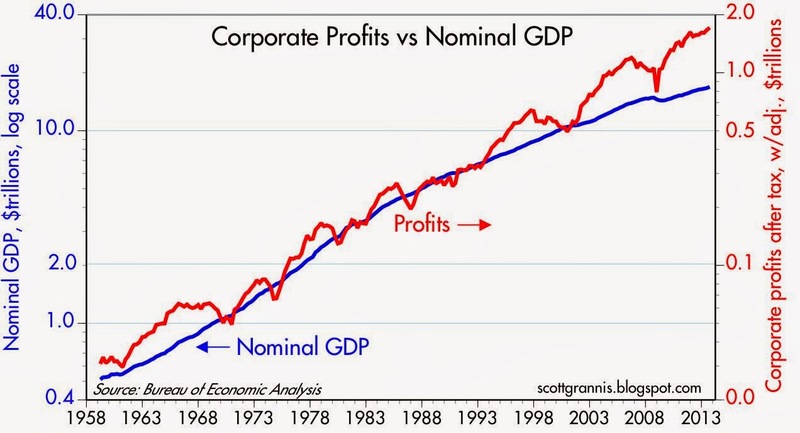 I note that profits declined well in advance of the equity peak in 2000, and they declined well in advance of the Great Recession and the equity peak of late 2007. To want degree has free money (low interest rates) meant to corporations bottom line? After all, the general economy is sub-par at best.. There must be a reason as to why companies are generating such a great deal of money; it certainly is not a booming growth..
Ben Jamin, you may have a point on the productivity side of things.